Description: Common to our kitchens, this species is native to Mediterranean, wild in Palestine, Syria, Mesopotamia and Greece. Within India, it is cultivated as a subsidiary crop in the black soils of Deccan and South India and in the rich silt loams of North India. This species is a native of southern Asia (probably India) and is cultivated extensively throughout the warmer parts of the world. It is grown on a large scale in India, China and East Indies. It is cultivated almost throughout India, particularly in Punjab, West Bengal, Maharashtra, Karnataka, Tamil Nadu and Kerala. 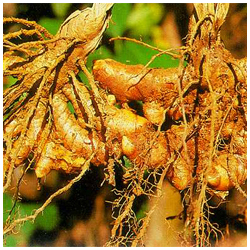 How to Grow: Soil rich in humus which is sandy in nature is ideal for growing turmeric. The mother rhizome is cured by covering it with sand during hot summer and planting is usually done in June. Each germinating rhizome is planted at a spacing or 1 to 1.5 feet and covered with soil. Watering is done regularly. Harvesting is done when leaves start turning yellow in colour and is done by digging the root stalks up. Care regime: Avoid water stagnation as it will affect the rhizomes and care should be taken during after cultivation practises as to not harm the rhizomes.